Convert any SATA or SATA II Hard Hard Drive to Standard USB 2.0 Port. Great For testing Drives and Moving data between Hard Drives. A must for all Testing, Migration, and Integration Benches. The World's First Integrated SATA to USB 2.0 Single Chip Solution! SATA and IDE Hard Drive & Optical Drive USB Adapter Kit COMBO with Power Switch and Back-Up Software, Works with XP and Vista! Simply just insert any 2.5” or 3.5” SATA I/II hard drive into the COOLGEAR Hard Drive Dock and you are ready to transfer, copy, or backup files for Windows Vista XP 2000 and Vista 64-Bit. NOTICE: New Units that ship after 05-05-2009 now include the 6Amp (3A 12Volt + 3A 5Volt) High-Power AC Adapter $19.98 Value. 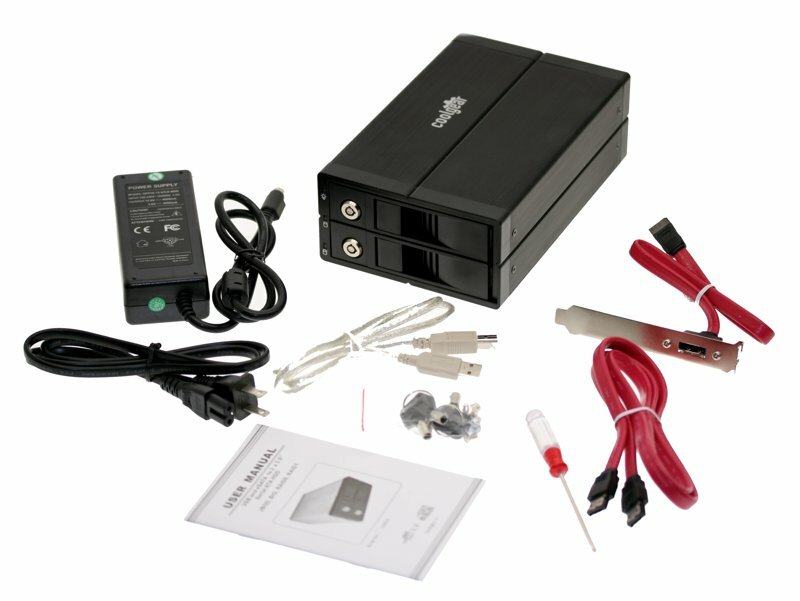 Our ASD-123 is Available and has the same function plus a power switch, for same money (click here)! The Only USB to SATA/IDE adapter that is Fully Tested with Microsoft Windows Vista Home Windows Vista Business Windows Vista Ultimate and Windows Vista Enterprise. All Current Makes and Models of SATA and IDE Drives will work with this Adapter! The USB 2.0 to SATA Drive Adapter implements a bridge between one USB port and one SATA or SATA II based mass storage device port. The USB 2.0 to SATA Drive Adapter turns any standard SATA drive into a convenient external drive. Supports SATA Hard Drives from 20GB up to 2,000GB (2TB). Easily transfer files from computer or notebook, back up files, or store large file archives on hard drives. This is the world's first integrated SATA to USB 2.0 single chip solution for large capacity drives. The JM20337 is single chip solution to bridge between USB 2.0, SATA and ATA/ATAPI-based mass storage device. It provides the capability to translate USB 2.0 mass storage commands to serial ATA and ATA/ATAPI communication protocol. The SATA to USB 2.0 cable adapter comes completely packaged with the SATA to USB 2.0 adapter converter, AC adapter, AC power cable and Drivers on disk for Windows 98 SE operating system. The SATA to USB 2.0 Adapter is very easily connected to the SATA drive. The adapter's SATA port connection is notched for proper alignment to the SATA hard drive port. The AC power adapter as seen above is connected the the back of the SATA adapter for power to the drive for proper operation. Red and Green LED's once powered up show operation of the drive while in use. With the SATA to USB 2.0 adapter, your SATA hard drive will transfer it data via the USB 2.0 cable attached to the adapter at the USB 2.0 transfer rate of 480 Mbps, this being the limit of USB 2.0 Specs. In working with the SATA to USB 2.0 cable adapter converter the male to female connector was a good tight fit when mated together. When connected to the power supply, power up of the hard drive was instant as the LED indicated. The connector on the converter unit must be aligned properly by aligning the notches in the male connector with the female port of the SATA hard drive before use. The SATA to USB 2.0 cable adapter converter. See a larger image. Connection diagram of the Serial ATA to USB 2.0 converter. See a larger image. Serial ATA (SATA) or IDE 2.5" and 3.5" to USB 2.0 Cable Converter Adapter with Power Supply. The Hi-Speed USB 2.0 to Serial ATA (SATA) or IDE 2.5" and 3.5" Drive Adapter ... SPECIAL, Now you have the IDE and SATA Adapter COMBO Unit! New SATA to USB adapter model with Hot-Plug and HOT-SWAP Reset Button. World's First Intergrated SATA to USB 2.0 Single Chip Solution. ©SATA Cards Copyright 1997-2005 SATACards.com QCUSA. Part of COOLGEAR Family All Rights Reserved. All Hard Drive Capacity Supported Including but not limited to: 10GB/20GB/40GB/60GB/80GB/100GB/120GB/160GB/200GB/250GB/320GB/400GB/500GB/750GB /1,000GB/2,000GB.